Thank you for arcane wyrms. I have a feeling I'll be using one! Thank you for making my hunter so much fun to play. Seriously, a thousand times thank you! There's always something new to look forward to each patch. On that topic; a heart-felt thank you for the rares coming in 5.1! Thank you for the armored dragonhawk, gray dragonhawk, and especially the arcane wyrms coming in 5.1! Noah! Pretty pretty please, can they look at maybe splitting Parrots off into their own family? Thank you for allowing us to keep our harmless buff pets and for understanding that none of us meant any harm (none of the Petopians, of course). Always be kind to your pets... or else. There has not been any love in this topic for a while so I am here to drop some. Thanks for everything past and present, it really is appreciated. The shadows are my ally...and so is that large wolf behind you. Noah, I don't twitter so hoping maybe you'll see this thread again instead! Please can we have Penguins, Frogs, Pythons/Snakes and Shoveltusks? My pets mean a lot to me. Thank you! There's so many cool pets and I appreciate the different ways to tame them. More challenge tames! Thank you Noah (and other individuals responsible) for the ability to tame Feathermanes! 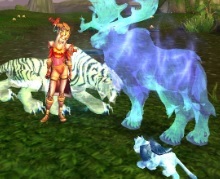 I have personally wanted to tame hippogryphs, gryphons, and wyverns ever since BC/Wrath. It's nice to know someone is listening. Basically everything I've wanted has been made tameable eventually (thanks! ), other than the Pug. Someday! But if we could get another wolf with the Jandvik Ripfang coloration, or just a rebellious Jandvik Ripfang that remains tameable after the quest locks you out of ever taming them, that'd be much appreciated.